“Relics of the Old Republic” picks up right where we left off at the end of “The Lost Commanders.” With the Imperial forces on their way, our heroes and their newfound allies (clones Rex, Gregor Gore and Wolffe) have fastened the giant joopa to the AT-TE and are making their way across the desert. Adding to the complications, Sabine gives a status report on the Phantom that is not very encouraging. The probe droid has caused significant damage to the landing craft and they still need more time to fix it. At the same time, an approaching sandstorm is speeding up the timetable whether they like it or not. On the plus side, Captain Rex has provided a list of potential bases for the burgeoning Rebellion. Among them are forgotten Republic, Separatist, smuggler, and pirate options. There are even some Mandalorian bases that the vaunted warriors themselves have forgotten. But although he came through with the intel, Rex and the other clones are reluctant to go the next step of actually joining the Rebellion. “Our war’s over,” Rex tells the group. As we saw in the previous episode, this lack of purpose is a difficult thing to reconcile for the veteran warriors. In the meantime, we find that Hera and Chopper are continuing to repair the Ghost when the Empire finally shows up in the form of Admiral Konstantine’s Star Destroyer Relentless. Immediately, Hera shuts the Ghost down to avoid detection and plans to pick up the crew when all repairs are completed and the Empire is not looking. But Wolffe does try to fix his mistake by playing it off and blaming his cybernetic eye for the false report. But since it’s Agent Kallus on the other end, the ploy does not work so easily. In fact, Kallus responds with video footage from the probe droid that clearly shows the AT-TE with the Phantom attached. Regardless, Captain Rex, who’s been listening in on the conversation is unimpressed with the troops that Kallus would be sending and mockingly says he hopes that the Imperial commander has brought a better class of soldier than the stormtroopers to the fight. But Kallus knows that he has numbers on his side and that even if his soldiers are not of the same ilk as the clones were in their prime, they are still effective in their own way. Hating stormtroopers is certainly a common trait for both the clones and the rebels, but when a TIE fighter locates the group and begins its attack, there is initially quite a bit of bickering amongst the group. Kanan especially is very critical of the clones and at one point refers to them as “useless.” But he soon eats his words as the clones, excited to be back in a fight, remind everyone of the awesome force they were–especially as Gregor uses a rocket launcher to bring down the TIE fighter with one shot. Even so, Kanan remains resentful of the clones and reminds them of the incoming storm and that the fight is not over. Ezra tries to make peace, but it will still take Kanan a while to come around, so he takes his frustration out on others and angrily orders Sabine to fix the Phantom as quickly as possible. In orbit around the planet, the Imperials are planning their next move. And we get to see definitively that though he is an admiral in the Imperial fleet, Konstantine answers to the recently promoted Commander Kallus of the ISB. With his reputation as a tactical genius and ruthless warrior, one could argue this dynamic has more to do with the man than his position. In any case, Kallus declines the option of an orbital attack and orders the admiral to “Prepare for ground assault” in a tone that instantly brings to mind the battle of Hoth and dialogue spoken by General Rieekan who was anticipating being on the defensive of such an attack. While waiting for this attack, Rex and Ezra continue their conversations which are imbued with a great deal of mutual admiration. Ezra begins to ask about Rex’s experiences in the clone wars. The former captain speaks highly of the Jedi general under which he served under and how he trusted him so completely that he would do anything to keep the trust–which seems to be an allusion to the removal of his inhibitor chip. And as the Phantom nears completion of its repairs, Rex accepts responsibility for the Empire knowing that they are there and he assures the boy that the clones will deal with the consequences. But what the Empire has sent is beyond any of them. AT-ATs begin to make their way across the desert landscape. The clones first reaction? They’re impressed. Especially at the new Imperial walker makes its way forward on only four legs. Even so, they know their severely outgunned and that retreat is most likely their only option which unfortunately means they must leave the giant joopa behind. Having to choose between a direct confrontation with the walkers and entering the storm, Kanan leads his friends into the storm. Though everyone inside will technically be blind, a Jedi with the Force as his ally will still be able to navigate his way through. Fully inspired, Rex shows his faith in Kanan. The old soldier wants to believe. And so the rebels enter the storm. Perhaps harkening back to that other sci-fi franchise, Kallus like Khan Noonien Singh (in Star Trek II: The Wrath of Khan) before him boldly enters the storm despite the difficulty in tracking his prey. And he almost succeeds. For although Kanan is using his heightened Force abilities to sense where the AT-ATs are, Kallus is able to surround the rebels. It will take a miracle for them to survive. But fortunately for our heroes, miracles–like Sith Lords– are their speciality. With one Jedi coordinating the attack (Kanan) and the other taking the shot (Ezra), the nearest AT-AT is brought down and the Ghost crew and the clones are able to make their way out of the storm. It’s a thrilling sequence that reminds one not only of A New Hope (Kanan tells Ezra that he’s not going to see the target much like Obi-Wan told Luke that his eyes could deceive him) but also Return of the Jedi (Ezra’s response to Sabine’s order to not miss is a very Han-like “Hey, I never miss”). Also of note is the scene in which Rex hands his old clone trooper helmet to Ezra. It’s clear he has full faith in the boy, but it also seems that the boy reminds him quite a bit of another young Padawan he served with–Ahsoka Tano. While all this is happening, Commander Kallus’ air support has been called away by Darth Vader who has ordered the Star Destroyer to rendezvous with his shuttle. Not one to pass on an opportunity, Hera immediately takes the Ghost down to the planet’s surface to pick up her friends. And so the way is paved for Kanan, Ezra, Zeb, and Sabine to leave Seelos with their list of bases. Rex and the clones offer to provide cover for their escape, but the two Jedi are at odds over this development. Ezra feels like they are abandoning the clones while Kanan still hasn’t forgiven or let himself fully trust them. A good soldier to the end, Rex attempts to make peace between the two and proclaims that the clones are soldiers and are doing what they were born to do. The Phantom departs, and what follows is an epic clash between three full-size AT-ATs and one ancient, heavily-modified AT-TE. Rex and the others put up a good fight, but despite their bravery and possible insanity (according to Kallus), the clones are simply outmatched. But then the Phantom comes back as Kanan begins to make the turn himself. He doesn’t yet trust the clones, but he also doesn’t want them to die as he recognizes their basic humanity. With a spectacular leap from the Phantom, Zeb, Kanan, and Ezra board the AT-AT from the head, cut into the cockpit and commandeer the giant vehicle (another great Return of the Jedi homage). It’s “just like the old days” according to Rex and the tide turns. Rex delivers a killing blow to the nearest AT-AT that he and his friends have begun to upend and the tide turns. With the Star Destroyer gone, Kallus has no choice but to order a retreat while the clones celebrate. Once again, Jedi have led them to victory. Finally, two very different meetings occur on opposite sides of the galaxy. Aboard Konstantine ship, Vader’s shuttle arrives but not with the Dark Lord aboard. Rather, he has dispatched a new inquisitor, the Fifth Brother–a fearsome character in his own right who promises to succeed where Konstantine and Kallus have failed. 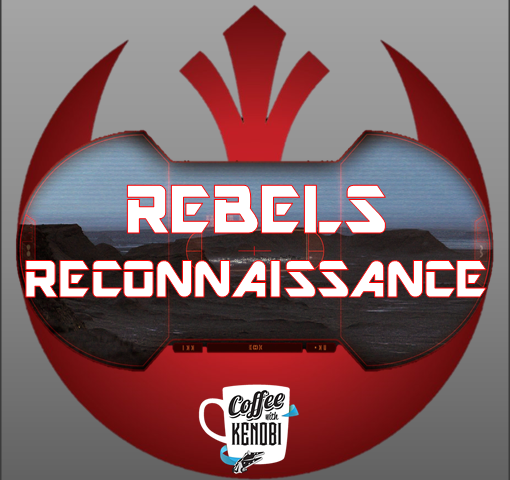 Next article CWK Blogger Jay Krebs Makes Her Podcast Debut on Bantha Banter!